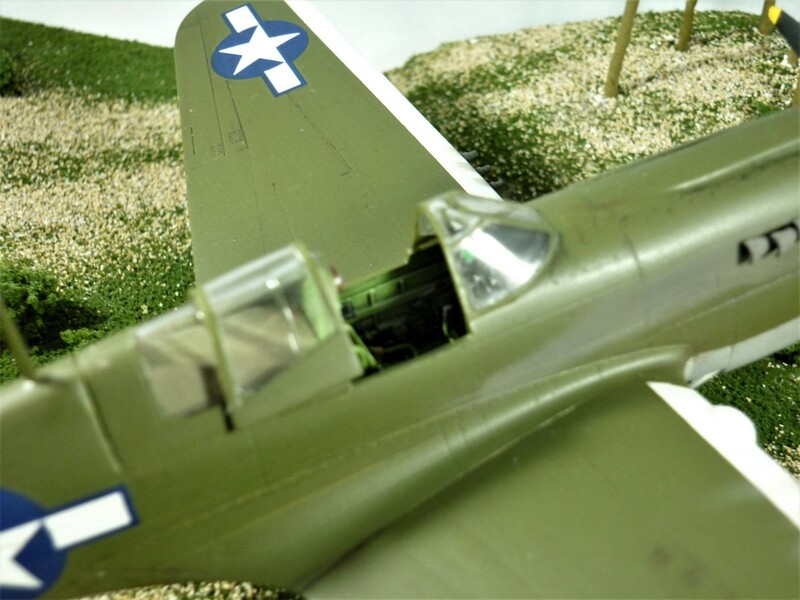 Another entry from what Louis Gardner has termed the “Bebout Curtiss Factory.” This is my attempt at trying to build two kits at the same time, which is a bit of a challenge, but nothing as crazy as when Louis does 6 Spitfires at a time. 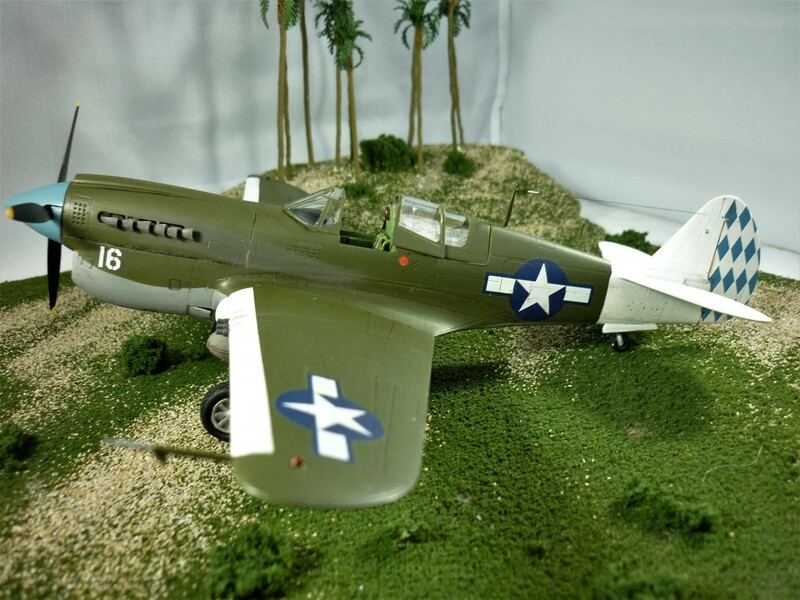 This model represents a a P-40N flown by Cpt Nathaniel Blanton from the 7th FS, 49th FG. 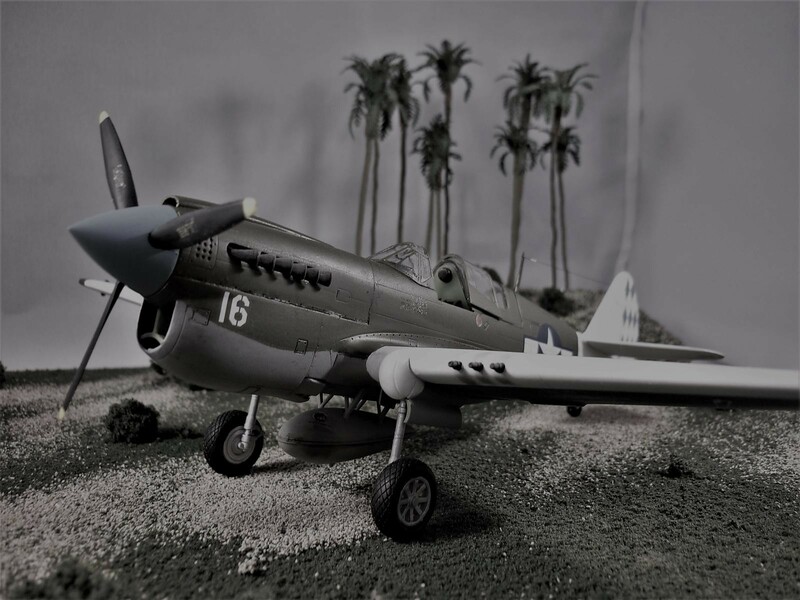 They were one of the first American Fighter Squadrons to reach Australia to defend against an expected Japanese invasion and would later deployed to New Guinea. 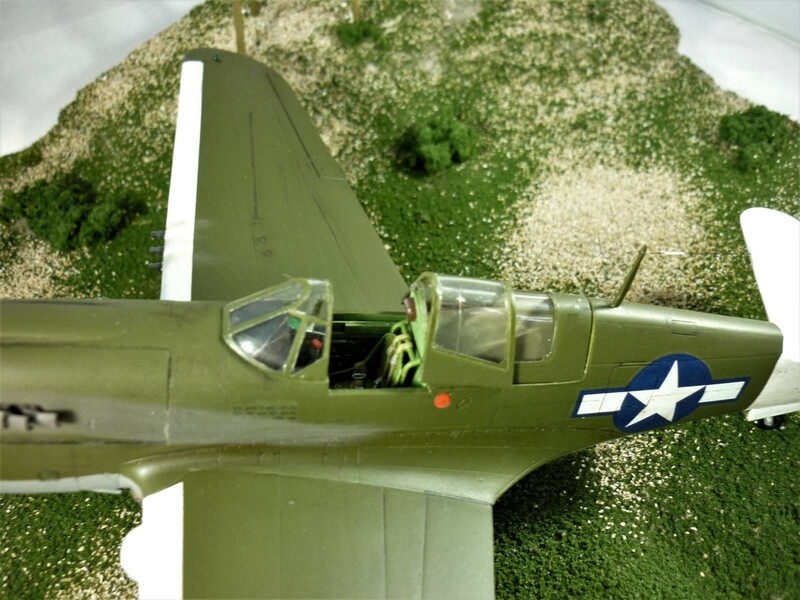 Cpt Blanton was an almost Ace with 4 destroyed Japanese aircraft. 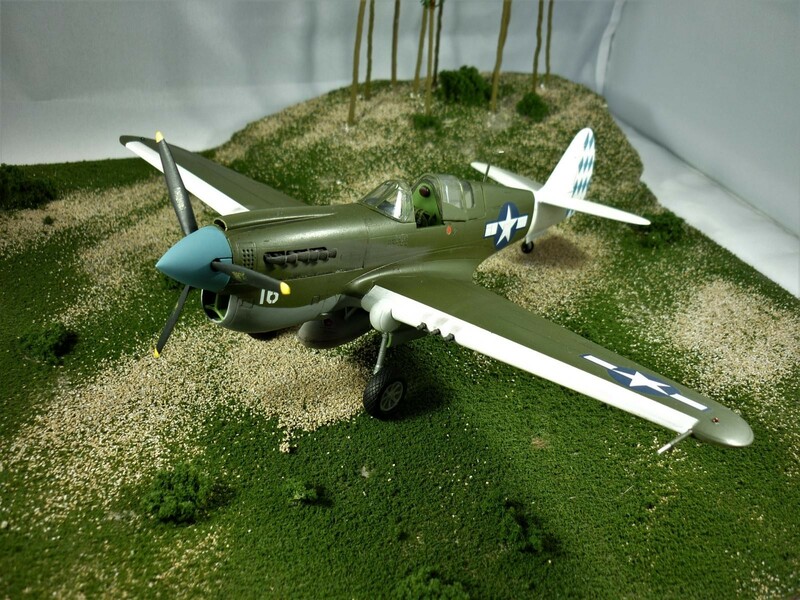 I’ve build several of the AMT P-40 kits and though lacking in some detail they do build into nice representations of various P-40 models. 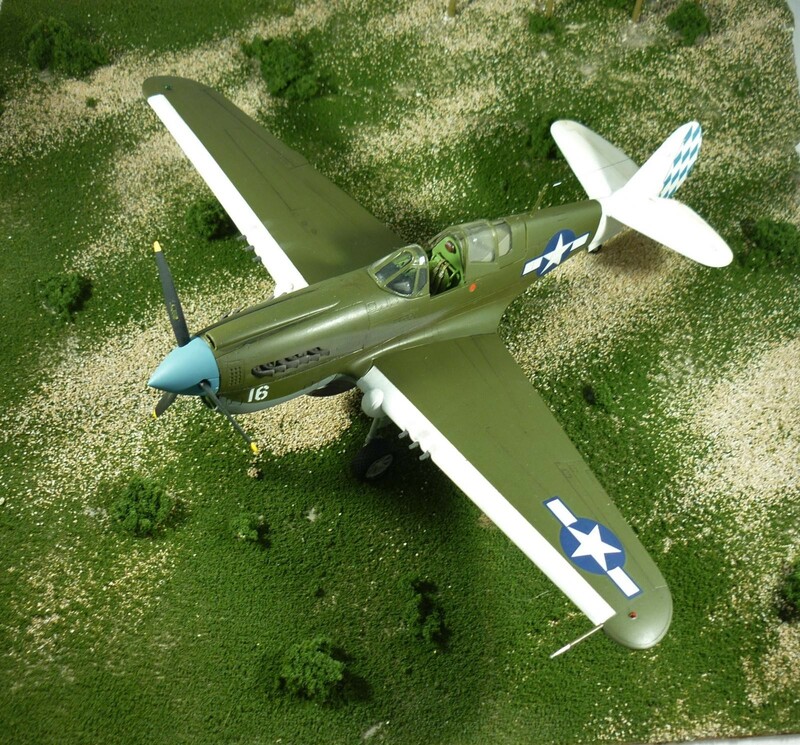 You can often find these kits at model shows at very reasonable prices. To enhance this models’ looks I added an Ultracast seat, some wheels and exhause stacks. 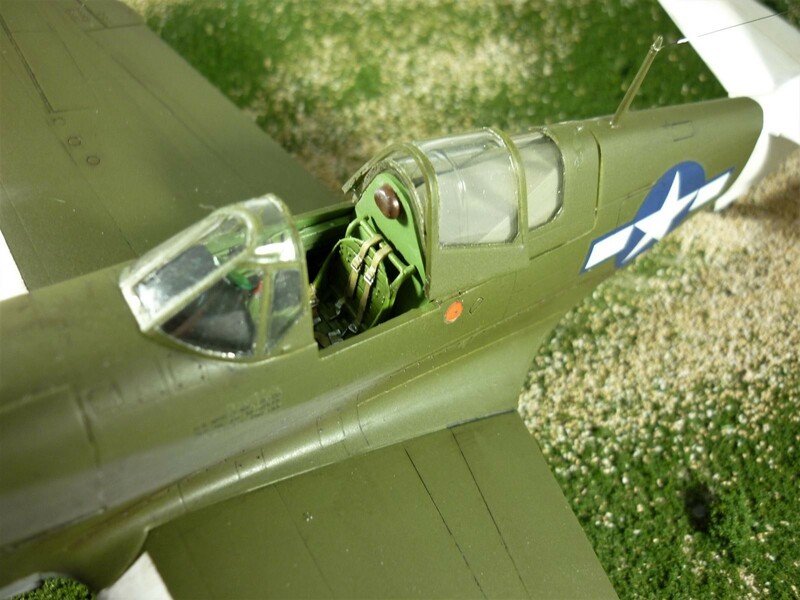 Paints were a combination of Tamiya and Model Master enamels and acrylics. Nylon thread was used as antenna wire and I drilled out the gun barrels. 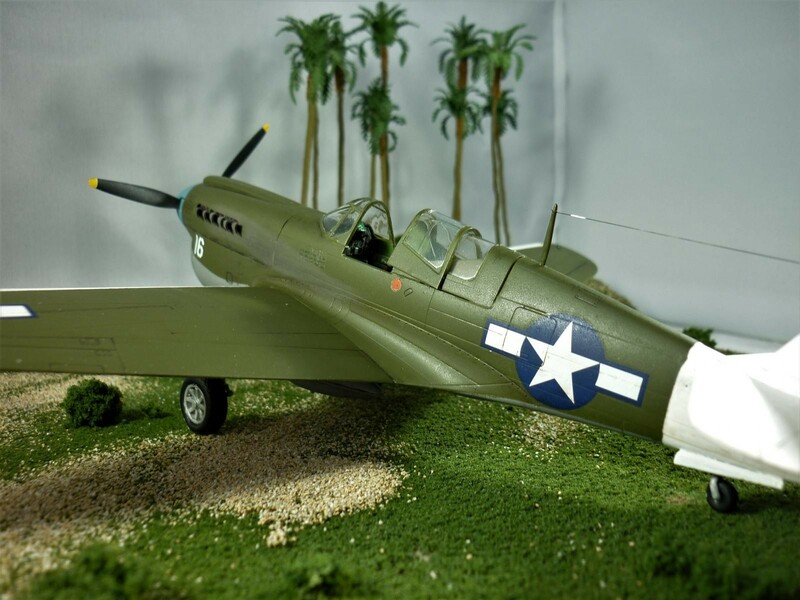 This P-40N is number 16 in my collection and I have 3 more to build in the stash, the new Airfix P-40B and 2 Hasagawa P-40E’s. Maybe DLS can ascertain if I have some form of excessive compulsive behavior disorder. In the mean time enjoy the view it was another fun build and that’s what a hobby is all about. I like it!!!! Nah, no compulsiveness. BTW; I have both the Amtech and Hasegawa E’s coming soon and plan to build both at the same time. Muy bien Tom! 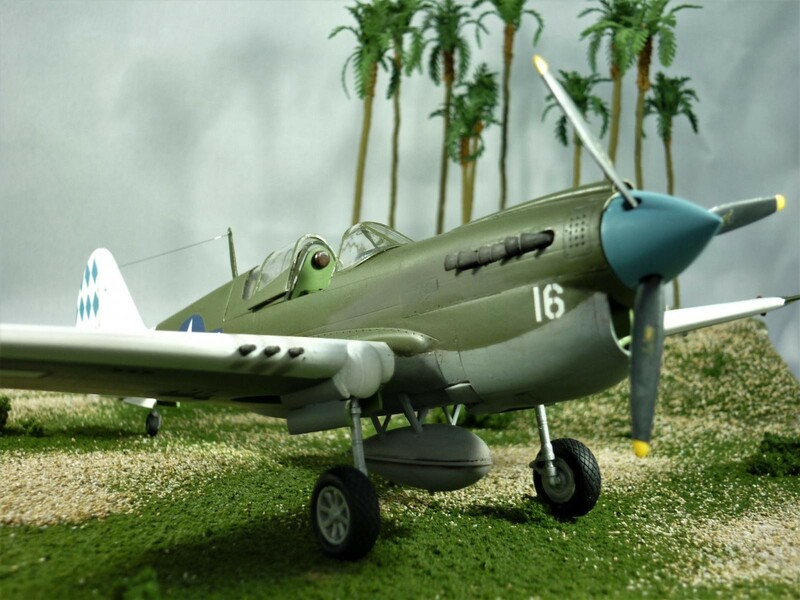 Es el esquema de colores más original y bonito que he visto en un P-40 y las palmeras le dan una ambientación perfecta. That’s a beauty, Tom! 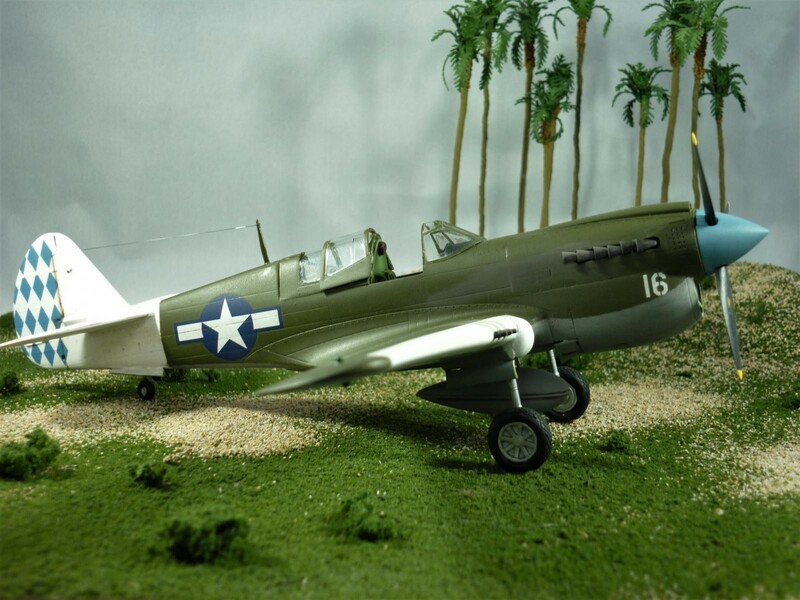 I have decided to do a P40 as part of the Hollywood GB next year. If it’s a patch on this I’ll be chuffed. I tried a number of builds together for the RAF GB. I’ll get there, but you are right, I can’t fathom how Mr G does it! You’ve nailed this one too. Looking forward to the healthy compulsion continuing! 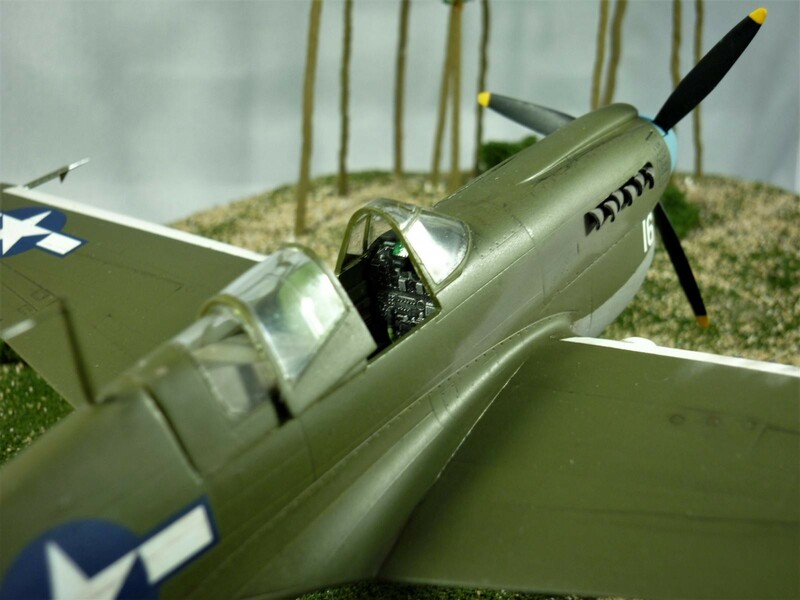 Thanks Paul, now get busy on that P-40. And yes I don’t know how Louis does multiple builds at the same time. Two were enough for me. Very good looking work there Tom … those colors make it really standout and give it a unique look. 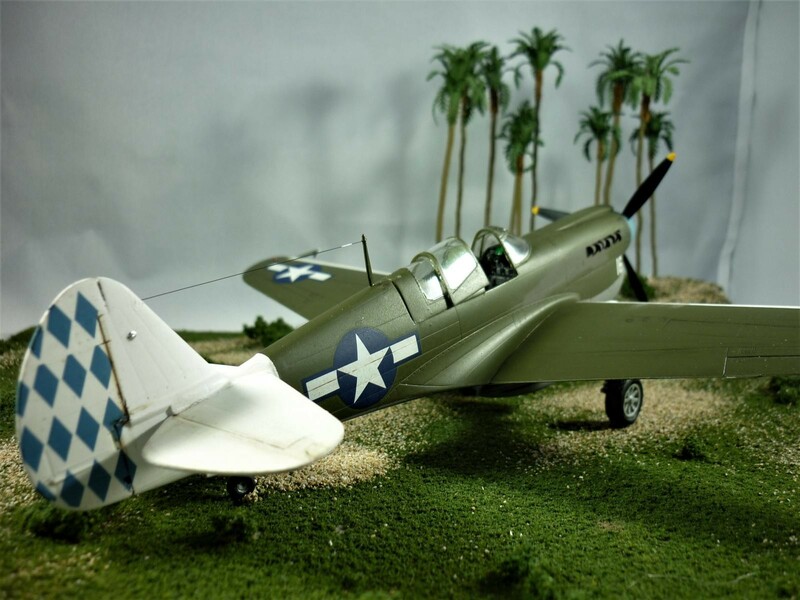 Thanks, once I saw the decals for this bird I wanted to build one. 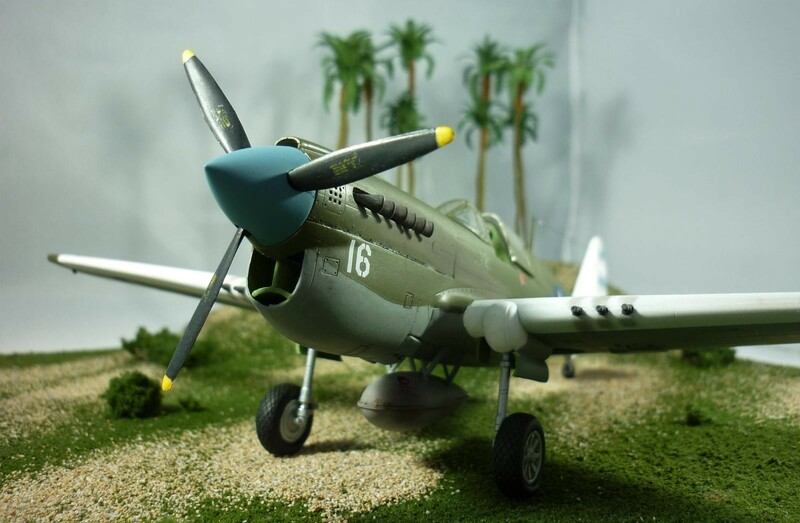 Sharp P-40. WHat a nice build. Looks impressive. Love the scheme you modeled. Unique. 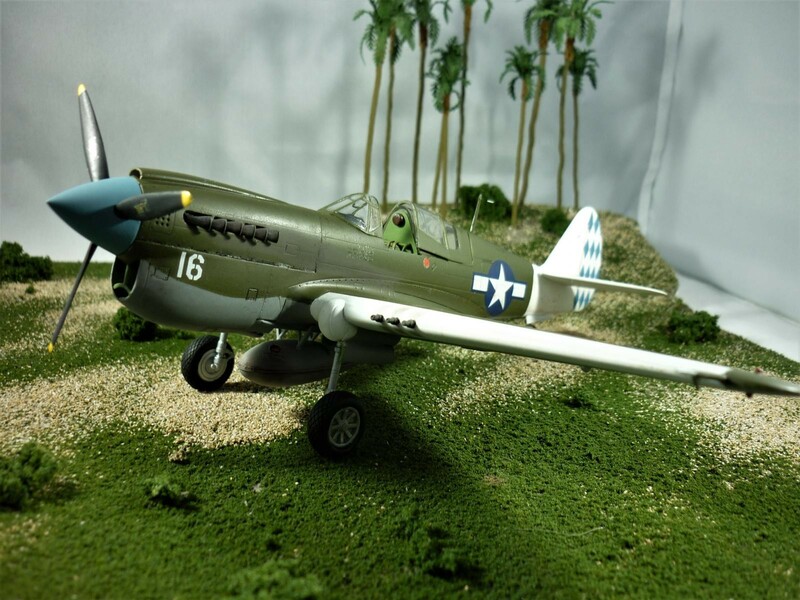 A fine build, Tom! I might have the disease too, I’ve got 14 Phantoms built with 2 in stash. 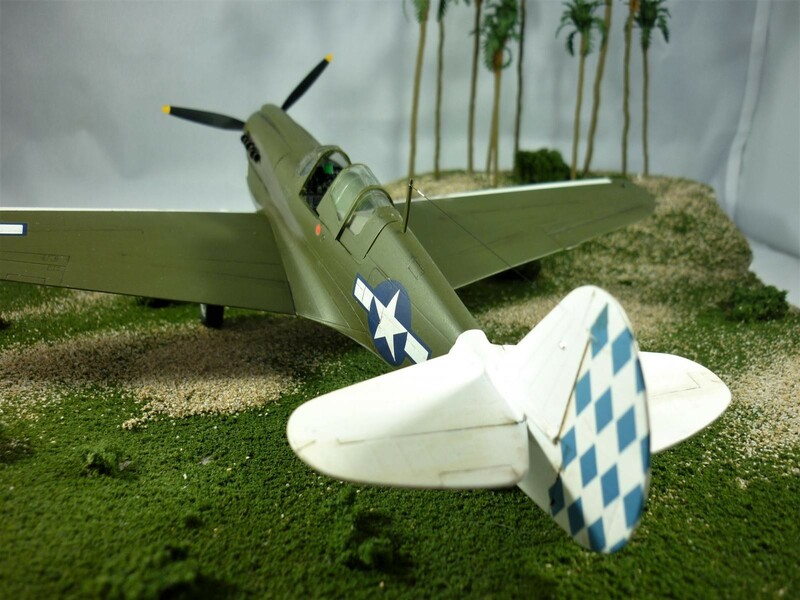 Love those white-tailed Pacific warbirds – and wow, that checkboard add to the tail brings a nice splash of color.